Price Reduced! Now only $5.95!! Do you ever get frustrated when trying to make simple easy recipes for your food allergic child(ren)? I know I do! Over the past couple years, I’ve come to depend on a few reliable recipes for basic foods that are easy to make allergen-free, and use mostly basic easy-to-find ingredients. In this eBook, you will find my 15 most favorite and most reliable recipes, with additional ideas for variations, creating a total of over 70 unique and delicious recipes. 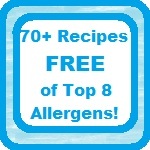 Every recipe in this book is free of the top 8 allergens, and are also free of sesame (#9) and beef (to which my Certain Little Someone is also allergic). Many of them are free of corn as well, or can be made corn-free. This is something I want to get soon! Do you have an affiliate program? If so, I’d love to sell it on my blog. I’ll probably link to it soon anyhow, even if you don’t.